We live in a time where there are more TV shows than ever before to watch. It can be really hard to make a choice--many shows have shortened seasons and yet there are so many to choose from. And there's only so much time. We like to read, see movies, and have a life as well! In any case, I will from time to time still write about some shows I'm watching that I think are worth checking out. Over the past couple of weeks, I finally got a chance to watch Timeless. Timeless has already completed it's first season (at 16 episodes) and there is no guaranteed of a second season at this point. Still, you can watch the full first full season on Hulu or NBC.com. And watching on these platforms at this time is the best thing you can do to help bring about a second season! What makes Timeless such a fun show is the history. It's a time travel show and I'm not for a second going to pretend there's a lot of logic to the way time travel works. If the past is "changed" there is often very little consequence to the world in the present of our characters. The premiere episode introduces this concept with very real consequences, but the subsequent episodes very rarely reflect this. So with that out of the way, the history is FUN! 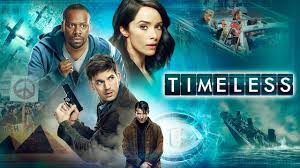 The premise of Timeless is pretty straightforward, there's a bad guy going back in time to change history with a stolen time travel ship and a small team (a pilot, a military man, and a historian) are assembled to chase after him in "the Lifeboat" another time travel ship and stop him from causing too much damage. The cast is great led by the wonderful Abigail Scott of Rectify and Suits and have a very enjoyable chemistry and banter. They visit many familiar and known times in history to varying degrees of success. They have a full wardrobe of authentic costumes at their disposal for their trips and they interact with many famous and known characters from history as well as those who are lesser known. Understandably, a woman going back in history will find certain restrictions on her freedom and Rufus, the pilot, is a black man. Which is important because it allows us to access history from his viewpoint. His reluctance to go back in time is established in the first episode and it's also possibly true that the show doesn't make things as difficult for him as it might be. (however, I think that's true for all the characters, this IS fiction) Still, through Timeless we learn about important characters in the past--often women and people of color. The show also utilizes enjoyable guest stars to play the characters in history. And...it's just a lot of fun. There is a huge overarching conspiracy theory and still a lot of questions about how time travel works. The show is a good time, though, and I flew through all 16 episodes rather quickly.